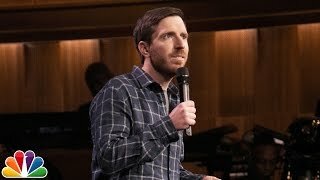 New York City-based comedian Joe Zimmerman has had an eventful couple of years. In addition to making his Comedy Central debut on John Oliver’s New York Stand Up Show, and was one of the prestigious comedians to be chosen to film a CC Half Hour stand-up special in 2014. Joe made his late night debut on the Late Late Show with Craig Ferguson, Preformed on Nickelodeon’s NickMom Night Out, appeared on the nationally syndicated Bob & Tom Show, and was chosen as one of the acclaimed New Faces at Just For Laughs Montreal, where he was positively reviewed by both The Spit Take and Time Out NY. Joe’s debut album “Smiling at Wolves” reached #2 on the ITunes Comedy charts when released by New Wave Entertainment in January 2014. Praised for an accessible style pairing absurdism with a fun loving demeanor, Joe has been personally selected by Ricky Gervais as a Conan contest finalist, other festivals, and can be heard regularly on SiriusXM and Pandora. He is an original member of the Beards of Comedy, the most requested tour in the Southeast from 2008-2012. The Beards released two albums (2011’s Cardio Mix on Comedy Central Records); their Beards Across America MSN web series amassed more than a million views.